Glitter, besides the mess it creates being all over the place, it's so pretty! And whenever I see someone with an eye makeup look that packs glitter, I'm in awe. My favourite look, especially during the holidays, is the dark smokey eye with silver glitter as the halo. Unfortunately, it's not easy to follow along and recreate this look based on tutorials, let alone a smokey eye on monolids. Those who have monolids all understand the struggle when it comes to applying eye makeup. We have to come up with our own techniques that not only look pretty when we close our eyes to show our masterpiece but also when our eyes are open. It's true! I've created eye looks that were amazing closed but once I opened my eyes, not a single shade can be seen. By now, I've learned my lesson. I thought I would give it a whirl and try to recreate the eye look that I have been inspired by so many and play with a little bit of glitter while I'm at it. With a bit of trial and error, I wouldn't say I've master this look on monolids but I got a technique down that will at least be a base starting point. To start off, I created a smokey eye and winged liner. Next, with my eyes opened, I applied glitter glue/primer and patted glitter onto closed lids. The reasoning - this will reassure that the glitter will be seen as I pack on the glitter onto the lids. Once the glitter is on and I'm satisfied, I touch up by redrawing the eyeliner. Then finishing the eye look by adding a coat of mascara and throwing on a pair of falsies. 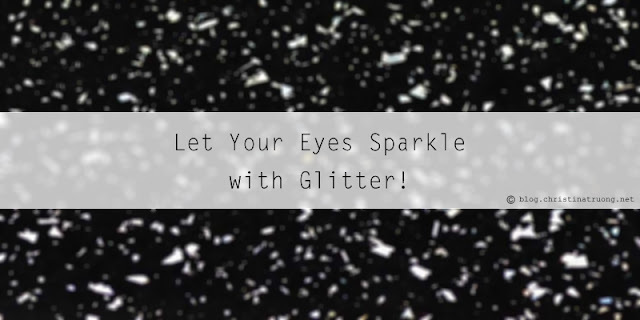 Have you tried glitter eye makeup? What are your thoughts on halo eye makeup? Do you have a favourite eye makeup look but can't quite recreate because of the your eye shape? Disclaimer: Not sponsored. Links denotes asterisks (*) are affiliate links. Views expressed are of my own.